Eight familiar shapes are brightly colored with bold outlines. 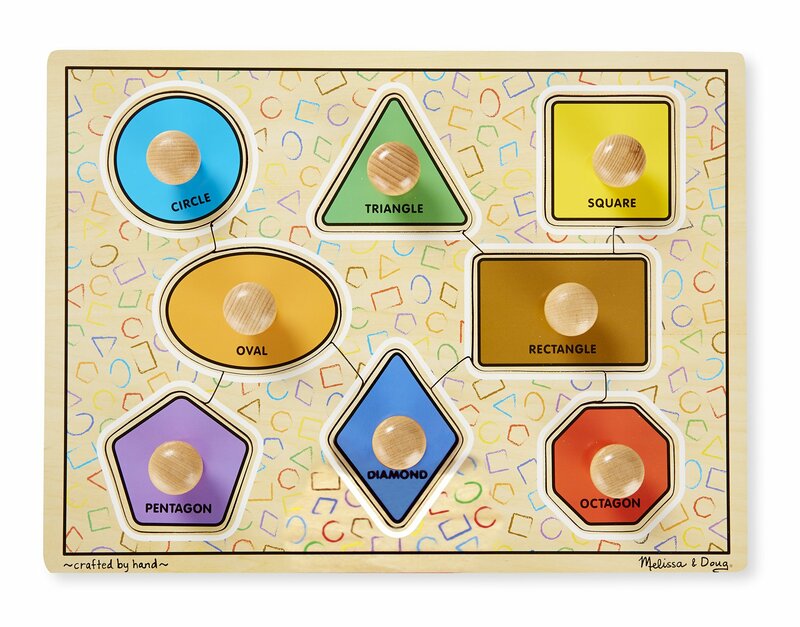 Extra thickwooden puzzle includes eight pieces, with jumbo wooden knobs for easygrasping. Full-color, matching pictures appear underneath each piece.Encourage hand-eye, fine motor and visual perception skills. From the Manufacturer Melissa & Doug toys are designed to nurture creativity and imagination. Fromclassic wooden toys to creative crafts, pretend play, and games, Melissa &Doug's products inspire exploration and enrich children's lives in a waythat's as engaging as playtime itself! Since the Company's founding more than25 years ago, Melissa & Doug has consistently delivered innovative children'sproducts with a commitment to uncompromising quality, safety, service andvalue. Well-designed, durable playthings should be accessible to all, andMelissa & Doug strives to foster wonder and a lifelong love of learning inchildren throughout the world.